The following recently came across the ASRAS email list from ASRAS and IOTA member Brad Timerson. If you’ve the gear for it, this is an excellent chance to contribute to some far-out science. There will be an occultation of a 12.5-mag. star by Neptune’s large satellite Triton the early evening of October 5th (just before 8pm EDT) that will be visible from east of the Appalachian Mountains. It’s the brightest star to be occulted by Triton since the Voyager flyby showed that the satellite has a substantial atmosphere with interesting dark plumes. The occultation will allow us to learn more about the atmosphere, and its variation with altitude and latitude. Sofia plans to fly over the Atlantic, to try to catch the central flash, where Triton’s whole atmosphere will focus/amplify the star’s light, probing deeper parts of the atmosphere. This might also be observed from Florida, but observations anywhere from the East Coast area are sought, to sample a wide range of latitudes of Triton’s atmosphere. 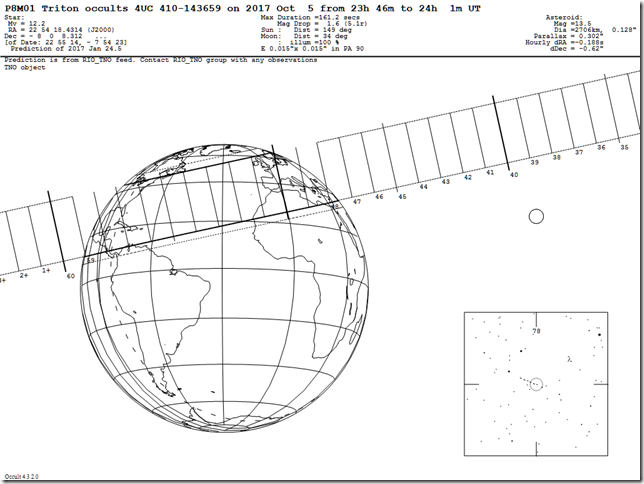 Details of the occultation are available at MIT’s Web site for the event at hubble.mit.edu/prediction.html. The central time for the Rochester area is within several seconds of 7:55:40 pm EDT on October 5th. For an observer near the center of the path, the event could last as long as 3 minutes. Because the Rochester area is north of that path, any occultation or atmospheric dimming would likely last some fraction of that time. You should plan to record the event for about 10 minutes before and after the time shown here. A main challenge of the event will be to record Triton and the target star with a good signal, preferably with clear separation between 8th-mag. Neptune less than a quarter arc minute away. You will need good scale to separate the objects well enough. More observing tips are given on the MIT web site. The target star is about a magnitude brighter than Triton. Telescopes as small as 8″ Newtonians will show the target star. (see included image from a European observer) For occultation work, we don’t need to “see” the occulting body (Triton in this case), just the object being occulted. Low light and/or integrating video cameras are best for this observation. However, standard astronomical cameras operated in a mode so as to produce images as quickly as possible will also work. Testing ahead of time to determine the correct exposure to just barely detect Triton should be done. This is to insure that the light from nearby Neptune doesn’t overwhelm that of the nearby moon and star at the time of the event. 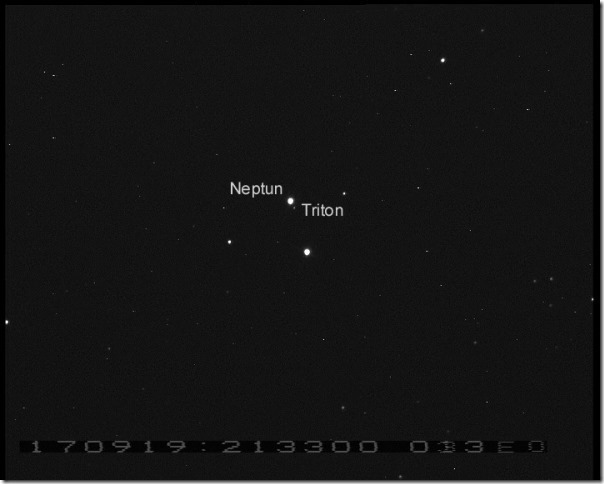 Target star, Neptune, and Triton. I plan on using my 10″ Meade LX200GPS at either f/6.3 (focal reducer) or at the normal f/10 prime focus. I will be using a Watec 120N+ low light video camera and integrating for 64 or 128 frames (2 seconds and 4 seconds). I’m still experimenting and might even need longer integration times. Triton occults 4UC 410-143659, 5 October 2017 – visible regions from Earth. Everyone with suitable equipment is encouraged to try this event. And I would appreciate it if this message is forwarded to any nearby universities that might have the ability to observe this event. If individual images are taken (instead of video) the exact time for each exposure is required (don’t depend on the computer’s internal clock. Use a GPS-based time). For analysis, it may be possible to measure the light level on individual images or the images can be combined into a video and measuring software used on the video. Please contact me (EMAIL) for additional information or to submit observations.